At this level it is no longer conducive to work. I have piled up enough stuff that I can no longer see what’s on the bottom. So, I avoided the whole deal for a few more days by drilling rocks, in the basement, where I have my drill press set up. I have finally trained myself to listen to books on CD, so drilling rocks in the basement is much more entertaining than it sounds. 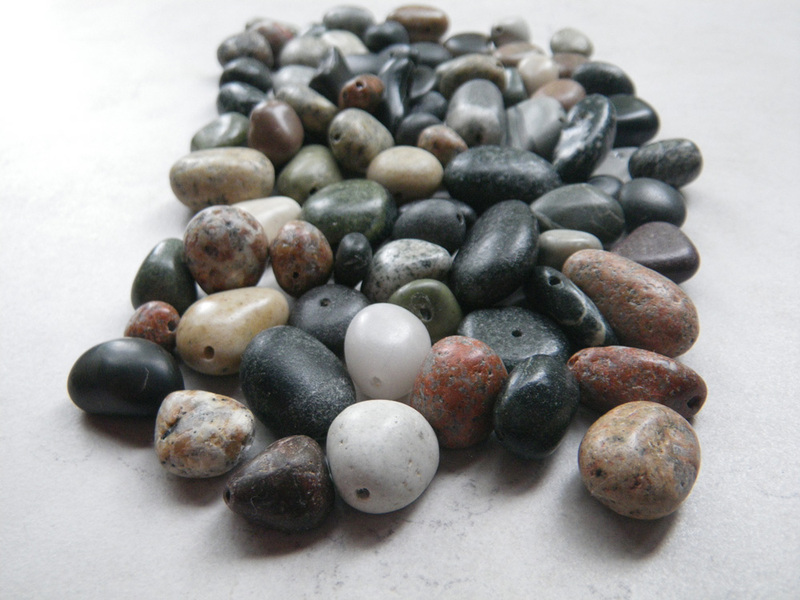 It is both meditative and exciting as I think of how I might use each stone. And, I’ve finished two books already. These lovelies made me want to clean up the studio so I could get to work on some fine silver beads to go with them. I have much to do to get ready for a November trunk show in Greenwich and two craft fairs in December. 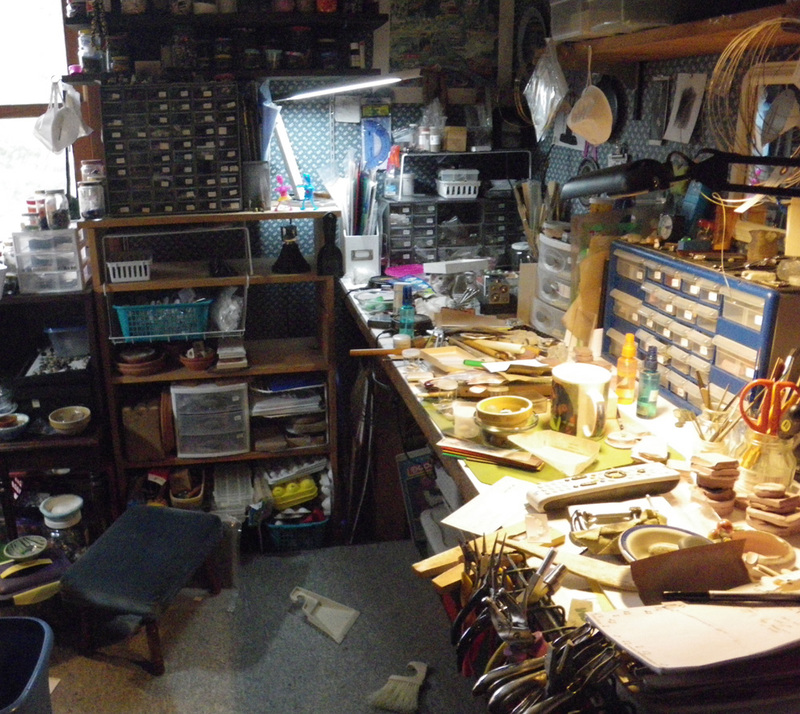 Along with cleaning up I also needed to reorganize tools, to incorporate some new ones among them, to find room to store the new supplies for all of the tear-away texture sheets I plan to make, (ie. 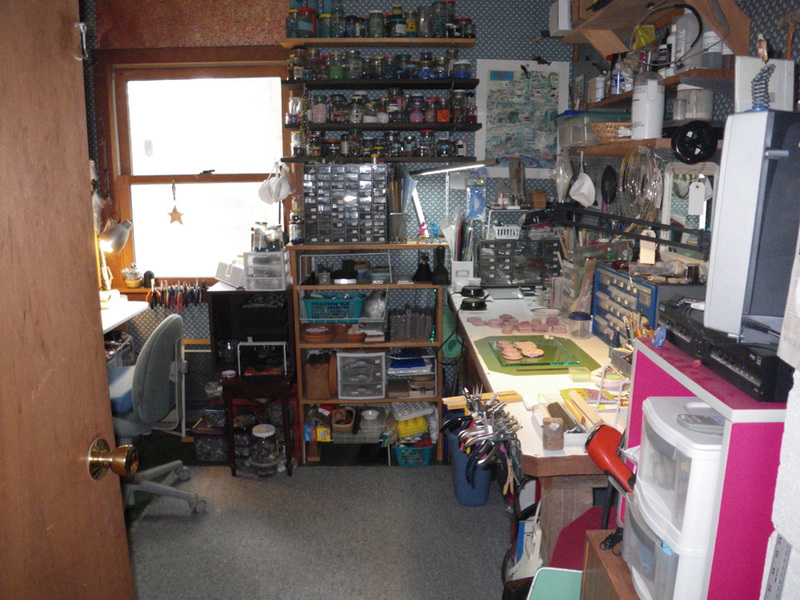 where to put all those packages of Studio Sculpey that is being discontinued in December and the pasta machine), and to find a place to store my oil paints and brushes until winter brings more time to use them. I can not concentrate on a book while sorting through so many little details. Disco is my aural motivator. Burn baby burn! 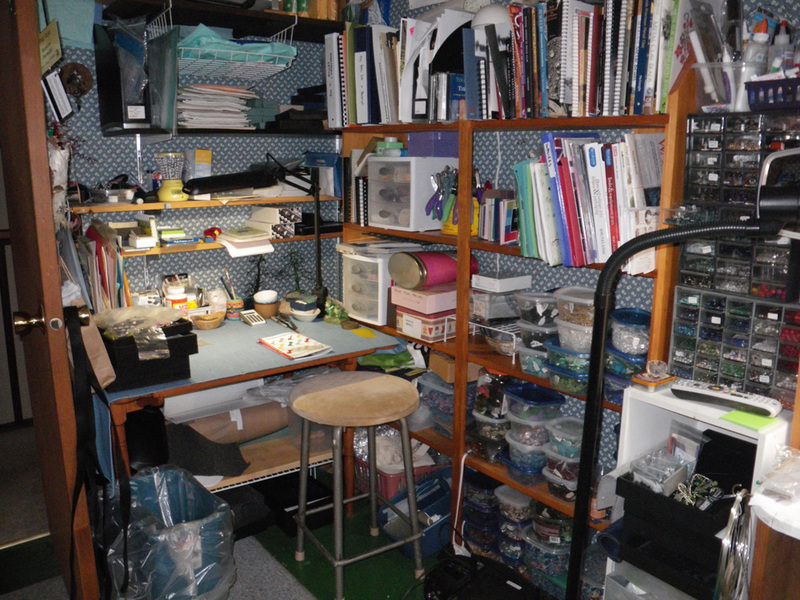 As one friend said when she first saw my (tidy) studio, “Wow, you pack a lot in here!” And for now, I know where it all is. You are an inspiration. 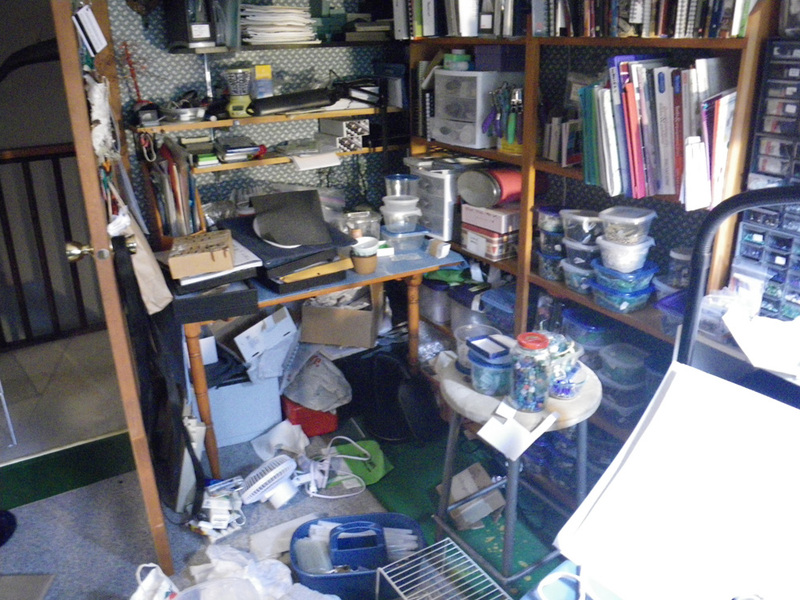 My studio looks like your top pics. I’m supposed to be cleaning it now, but I made a bracelet instead. Found some interesting pieces while I was trying to tidy and just kind of got lost. OK, you’ve thrown down the gauntlet. I’ll clean. I was just looking at your blog earlier and thought, “I wish I was as productive as she is!” So, there. I guess we inspire each other. I really like how that works. I can really relate to starting to clean and getting lost in some of the pieces that are uncovered. It always leads me away from cleaning. I’m happy to say the last few days I have been making metal clay beads to fire. I would like to get back to making some bronze and copper pieces and try some patina… There’s always something to pull my focus away from work! I love imagining you cleaning your studio to disco music. Jumping off the stool, doing a cartwheel and putting some beads back in a drawer all at the same time. It looks great! Good job getting that studio whipped into shape! Wowser Barb, This is so impressive! Thanks. Have you started packing for the big move? I wish I could impress you with some finished pieces. I’m working on it…. impressive was exactly what i was going to say! I’m hoping to fire a kiln load of beads tomorrow when I get back from spending the day with Mom. How’s your mom doing?